Thank you for helping us raise over $283,000 to benefit Rotary Camp for Children with Special Needs. February 2, 2019 was a beautiful winter’s day at Hale Farm and Village with over 550 golfers and volunteers attending the 29th annual Chili Open Golf Classic, presented by Wayne Homes. The day was a huge success and with your help, we raised over $283,000 benefiting Akron Rotary Camp for Children with Special Needs. 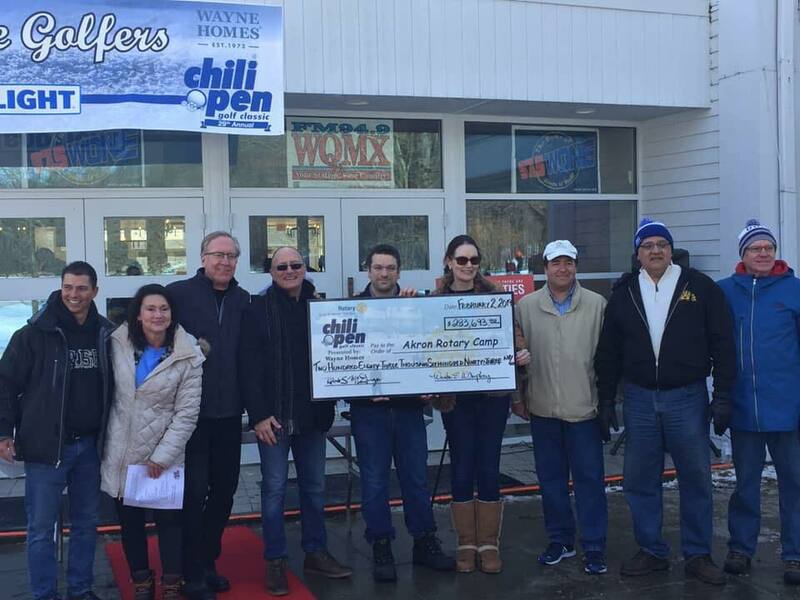 Annually, the net proceeds from the Chili Open will provide financial support to families in need. We are committed to never letting a family's personal financial resources prevent a camper from attending Rotary Camp. Last year, Akron Rotary Camp provided over $240,000 in direct financial assistance and served 1,900 children through their summer camp and year round respite programs, where campers can enjoy many traditional activities including swimming, canoeing, arts and crafts, sports and games, team building and more. We are extremely grateful to all Rotarians, sponsors, donors and volunteers who have helped make a difference in the lives of our campers through this year’s Chili Open! Because of your generosity and support, we will be able to provide meaningful opportunities to the campers and their families regardless of their ability to pay. Congratulations also to all the winners of the Raffle Prizes and Closest-to-the-Pin contest. We sure hope you enjoy your prizes. A big thank you to all the committee members for all your efforts and support to make this a very successful event. Your hard work and commitment surely means a lot to us. Save the date for the 30th Anniversary of Akron Rotary’s Chili Open Golf Classic that will be held on February 1, 2020. It is going to be big celebration.